So I have a bit of a thing for Gwyneth. I know sometimes she seems like she's a bit too much, but so do I. So I sat down and thought of all the reasons we would be best friends. We are Americans living part time abroad because of our significant other so we would have tons to talk about. We are both 5'9" and can bond over all the short friends in our life and refusing to let that stop us from wearing 4 inch heels. Have seen Coldplay in concert and met the band afterwards (it was back with their first album for me and was one of those dreaded meet and greets. She married the singer, I just said hi). We both love to cook and tell people how awesome we are at it. When questioned if it was difficult to prepare we both say 'oh no it is so easy' when in reality it took 6 hours and three tries to get it perfect. We both are way over Ben Affleck, but would totally do a movie that he was directing if for nothing else than to prove that we are always the bigger person. (Bonus we are also over Brad Pitt, although secretly think it's awesome that he dumped Jennifer Aniston for Angelina Jolie. Jennifer just seems so annoying). Like to eat healthy, but not afraid to indulge every once and again. Come up with ridiculous things that people should buy that they can't afford. So some of those things may be a bit of a stretch, but I like to think the Gwynnie in my mind is close to reality. 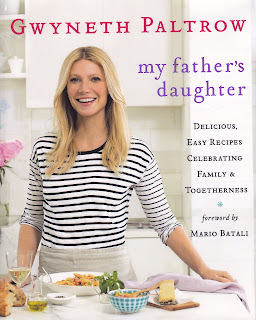 And in case you are interested I love her cookbook. You should check it out.